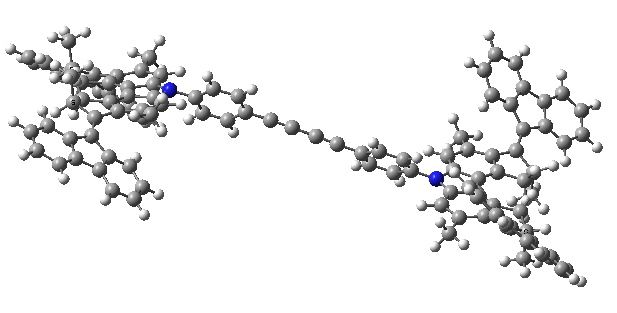 The car comprises a single (relatively small) molecule, shown above as the authors represented it. The motion along a surface comprised of copper atoms is driven by light as fuel coupled with encouragement from an STM probe. The distance travelled in a straight line was about 6nm in ten steps (note the nanodistance), although the average speed for the complete journey is not recorded. It is probably safe to say it was not recorded using a speed camera! The car rattling along a copper surface (grey). The chemistry is shown below. The car has four wheels (the fluorene units) which rotate about an C=C double bond axle using light as the fuel (a configurational change). The component labelled helix inversion can also be described by the chemical name atropisomerism, a topic I dealt with earlier with the example of Taxol and which is a conformational change. The nitty-gritty of the car's engine. These two processes are used to rotate the wheels in the sequence shown below (after which the wheels return to their starting point). 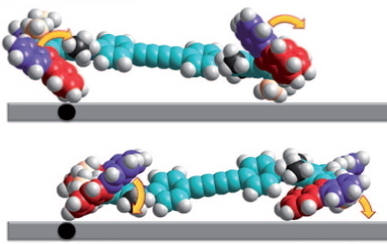 The stereogenic centres are fine, they are labelled (R) and (S), and they provide an important aspect of the mechanism for allowing the motions of the four wheels to be coordinated such that the car drives in a straight line. Much is made of this aspect in the article. It is the atropisomerism that starts to cause problems. Here the diagram contains emboldened bonds carved into a benzene ring. This convention was first proposed by Hubert Maehr in 1985, but his intended use has since been much abused. As I fear it is here. Although it is difficult to be certain, the benzo groups in the car are annotated with several Maehr-like emboldened bonds, and a few non-Maehr wedged bonds as well. It is all meant to indicate perspective, and probably not intended in the Maehr sense at all. 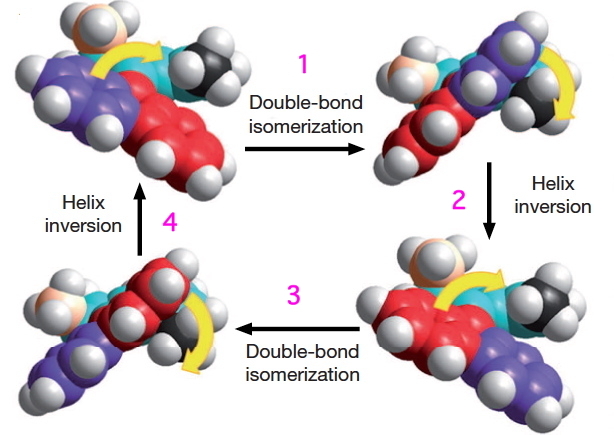 That latter feeling is reinforced when the benzo groups of the fluorene unit are annotated with dashed bonds replacing the single bonds in the Kekule resonance structure. Normally, a C- – -C is taken to indicate a breaking, or transition bond, but here it is again just an attempt at perspective (and a new addition to the bond menagerie). Well, it is possible to build a 3D model armed with these instructions (although it has to be done visually, with constant comparisons with the space fill representations in the article). 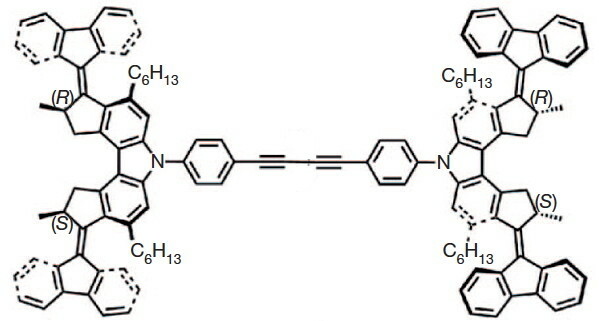 The initial conformation of the molecular car. Click for 3D. The car starts its journey by a light-driven rotation of the C=C bonds to form an isomer (about 8 kcal/mol higher according to my estimate using PM6). Car after step 1, double bond isomerisation. Click for 3D. There is then an STM-induced helix inversion, or atropisomerism. The two benzo groups are induced to swap over, much in the manner of bi-phenyls. The energy at this point is identical to the starting position. It is worth noting that the molecule was not returned to this position by reversing the first C=C rotation, but by two quite different operations (light and STM-electrons). I presume this was done to ensure the wheels turn in a constant direction, and do not simply flip back and forth randomly. Car after step 2, helix inversion. Click for 3D. Car after step 3, double bond isomerism. Click for 3D. and another STM-induced helix inversion returns the car to ~0.6nm on from its starting position. So to understand nanotechnology and nano-sized objects, all you need is a good training in introductory chemistry! But a plea please to nano-scientists. Could you please include 3D coordinates for your wonderful machines. Movies are fine, but to really see what is going on, I would suggest you need proper 3D models (not least because you can then use these immediately to test my assertions about the energies of the various conformations). Oh, I cannot resist observing that the group reporting this work probably do not ride motorcycles! Postscript: The optimised ωB97XD/6-31G(d) geometries for the two poses of the car are to be found at 10042/to-10227 and 10042/to-10219 The total energy difference is 15.5 kcal/mol (compared with 8 at the PM6 level). This entry was posted on Thursday, November 10th, 2011 at 5:37 pm and is filed under General, Interesting chemistry. You can follow any responses to this entry through the RSS 2.0 feed. You can leave a response, or trackback from your own site. I remember reading this in Chemistry World. Thanks for the extra explanations, I’ll be checking out the .fchk file in Gaussian if I have time and computing power.